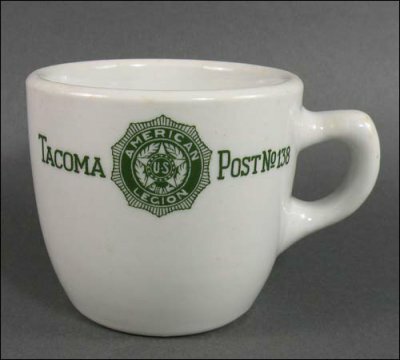 This heavyweight white mug with green American Legion decal is in great shape - no chips or cracks - and only light evidence of utensil use, discoloration and a slight less-smooth feel where the thumb holds the handle. It is 4 1/4" wide by 3" high and a great example of thick-bodied utilitarian ware. The wall of the mug at the rim is 1/4" thick! It was made in 1941.